Are you looking for Christmas earrings that are a bit on the non-traditional side? A sparkling pair of handmade earrings that you can wear well into winter and not just during the holidays? You definitely have found them here with the SNOWMEN IN PINK earrings, Or since the earrings are a perfect gift for a breast cancer survivor, they most likely are snow-women. 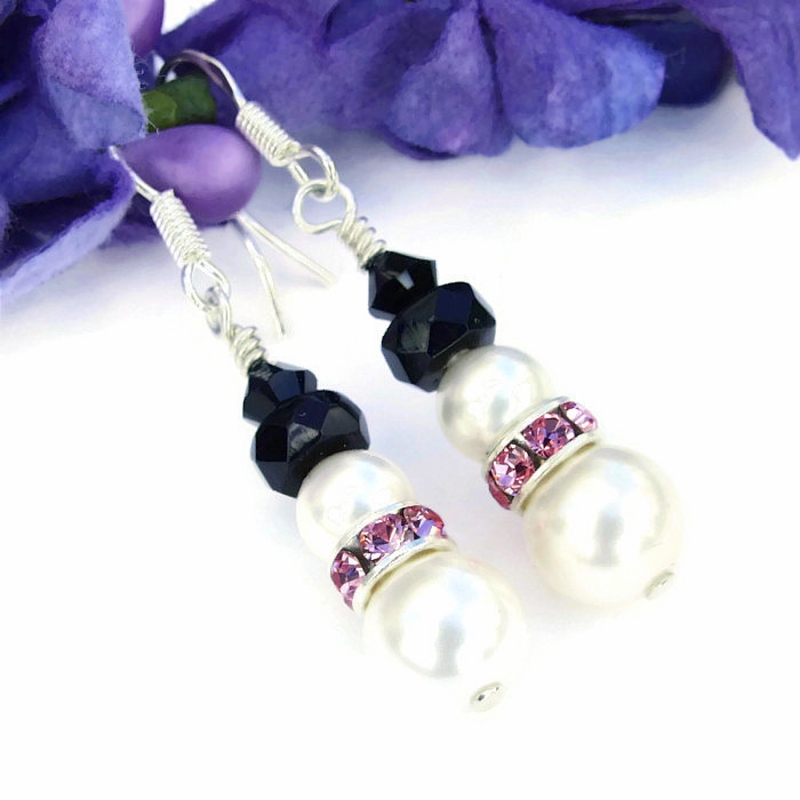 Created with two sizes of glowing Swarovski crystal pearls, "jet" black Swarovski crystals, pink Swarovski crystal rondelles and sterling silver, these unique, merry earrings just make me smile. Since the earrings are a bit more demure than traditional "in your face" Christmas jewelry, they can do triple duty: worn to the office, worn with Christmas party clothes and worn with any casual clothes. The handmade earrings exude a cheerful, whimsical charm and will quickly become a favorite piece of winter jewelry. 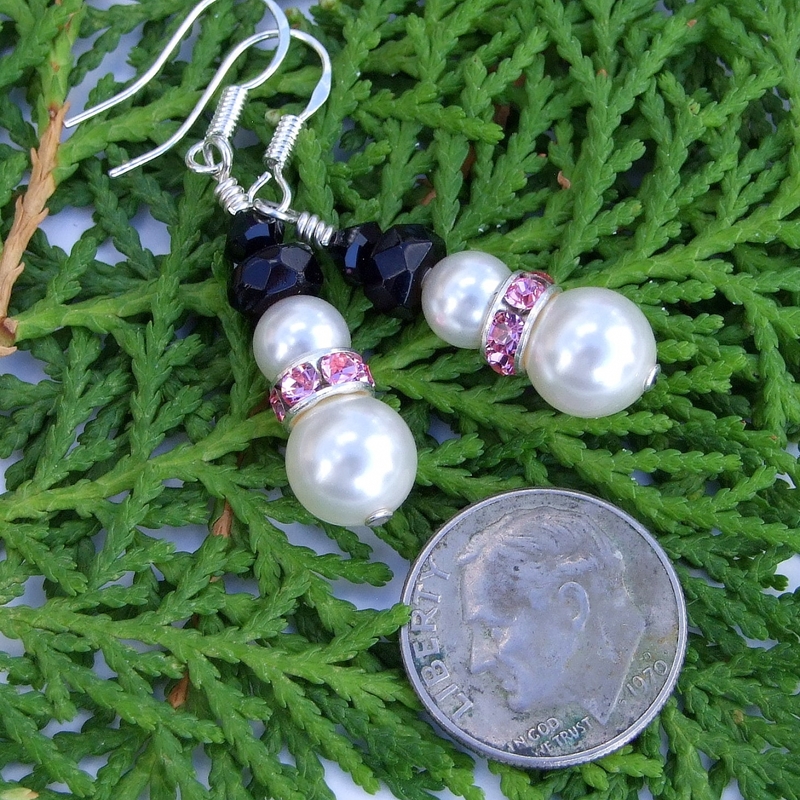 The SNOWMEN IN PINK holiday earrings were carefully handmade by Catherine of Shadow Dog Designs for the woman who loves unique, beaded jewelry. 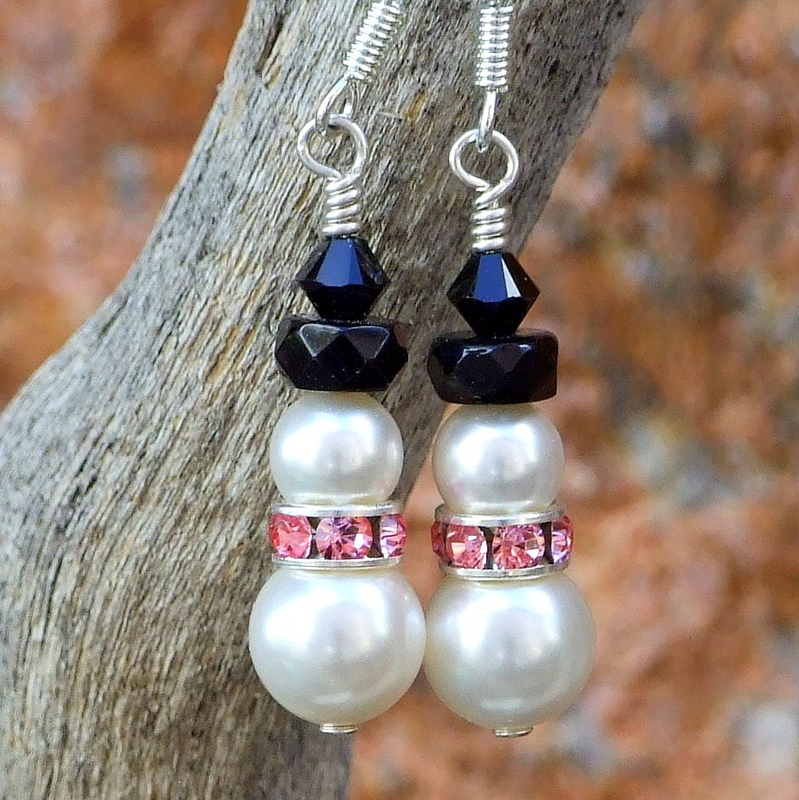 The meaningful earrings are also perfect holiday gifts for the woman who has survived breast cancer. Two different sizes of man-made white Swarovski crystal pearls were used to create the main body of the SNOWMEN IN PINK: 8 mm for the bottom and and 6 mm for the head. 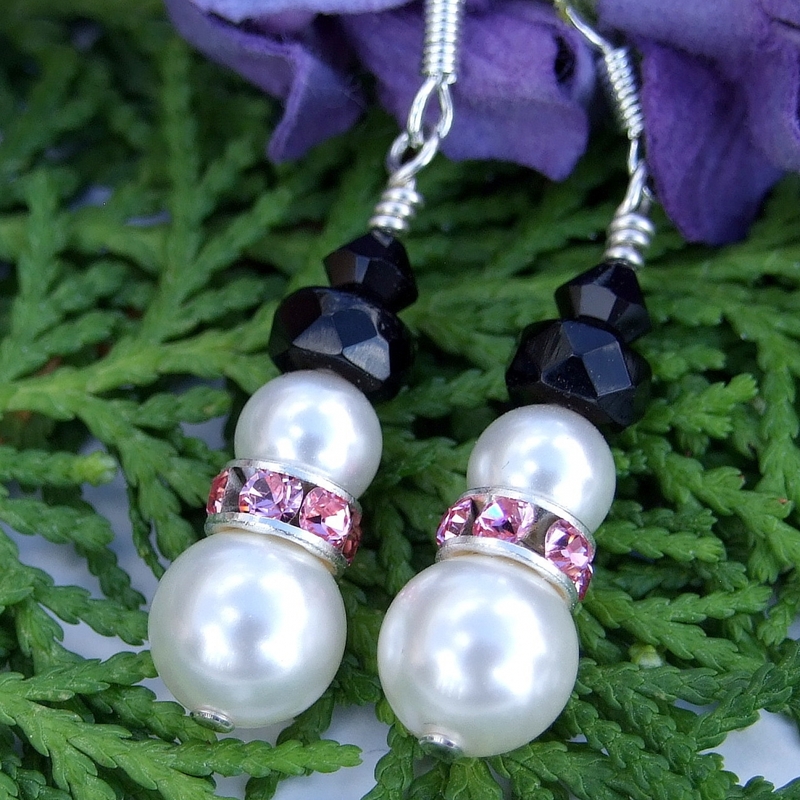 Just a little about Swarovski crystal pearls: unlike many synthetic pearls that use a hard plastic core, Swarovski pearls have a lead crystal core. This crystal core not only mimics the weight of real pearls, but it also allows the pearls to warm to the skin as real pearls do. Multiple layers of luminous pearlescence (crushed pearls) are added one layer at a time to give the look and feel of famous South Sea pearls - but at a fraction of the South Sea price! 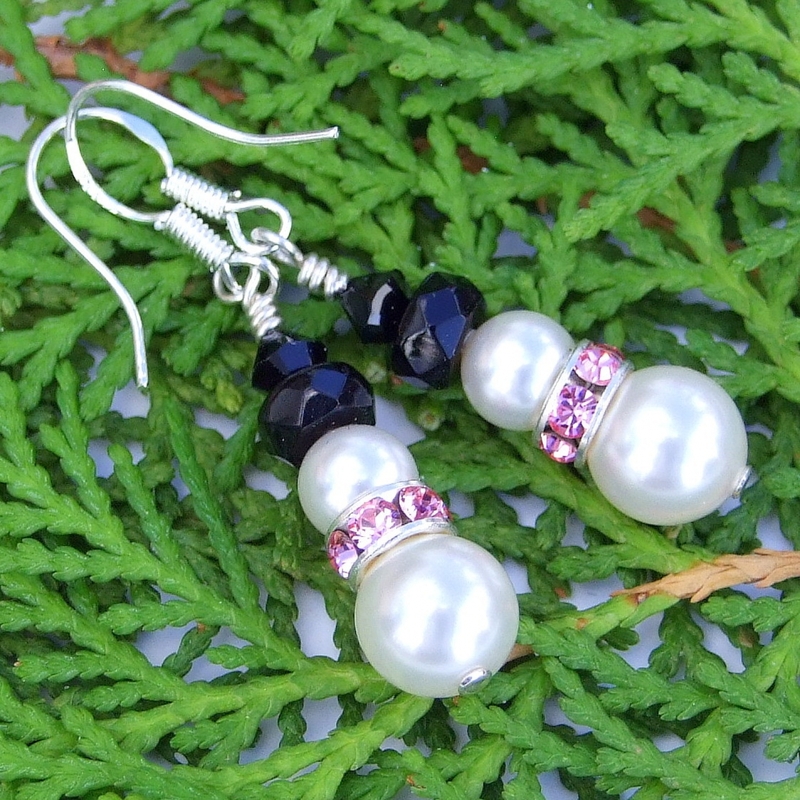 Just a quick glance at the photos above will show the exquisite, glowing finish of the pearls. And you should see them in real life! To add more than a touch of sparkly fun to the snowman earrings, and to buck the traditional Christmas holiday color scheme, silver plated brass rondelles set with faceted pink "rose" Swarovski crystals were used between the head and the body of the snowmen. The six rose Swarovski crystals that make up the collars of the snowmen might be small, but they sure glitter like their bigger cousins. I just wish the photos would allow the sparkle to show through! I think the pink color gives the snowmen a very whimsical party look. All well-dressed snowmen must wear a top hat. The hats of the SNOWMEN IN PINK were created with two types of "jet" black Swarovski crystals. To create the brim of the hats, faceted Swarovski crystal rondelles were used. The crown of each hat consists of a faceted "jet" Swarovski crystal bicone. 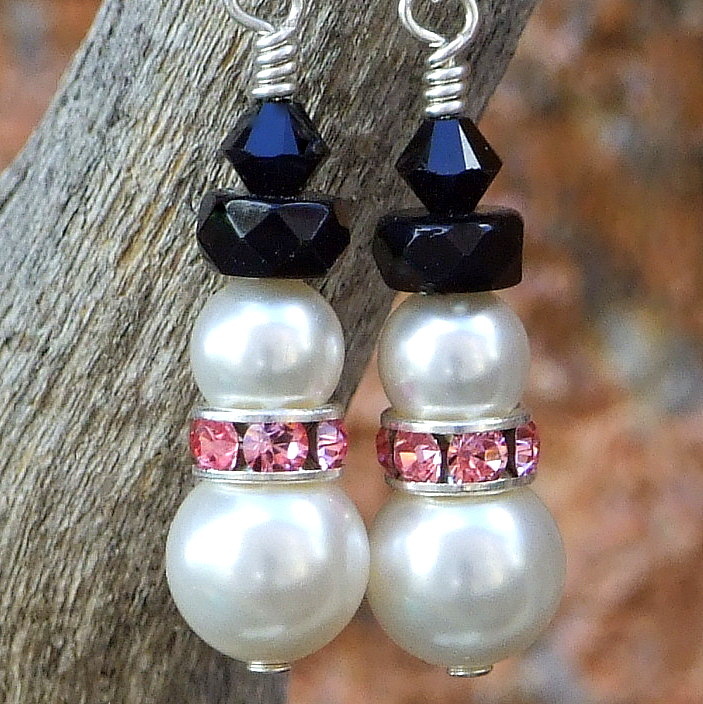 These crystals add even more sparkly goodness to the earrings. The body of the earrings were strung on sterling silver head pins. The top end was carefully wire wrapped into a loop and then connected to sterling silver French hook earwires. A perfect finish to fun pair of snowmen earrings. For a better understanding of the relative size of the SNOWMEN IN PINK earrings, please be sure to check out photo #5 for a size comparison with a dime. Glass (manmade crystal) carries the energies of transformation, rebirth and communication. Silver is a metal of love and healing; it is a mirror to the soul, helping us to see ourselves as others see us. The SNOWMEN IN PINK earrings will be carefully packed in an organza jewelry bag, perfect for gift giving to a loved one . . . or to yourself!